People love canon. At least people invested enough in a work to argue about it on the Internet do; and sure enough, there's nothing better than to add to the content that is indisputably canon since it is source material, because if there's something better than a good thing, it's MORE of a good thing, and if this additional material is not canon it did not "really happen" and as such is sadly useless... right? Personally I happen to disagree (if you couldn't tell already), but this blog post is not about that. More to the point, this thread on our forums, and especially my snarky impulse reply within, got me thinking - why does "Word of God" matter so much to people? Sure, I wasn't being nice*, but what does "we've (...) been known to troll, lie, change our mind, and make stuff up on the spot" actually mean? The ability to play with the fanbase's expectation is one of the perks of what we do. In all honesty we think that the product will include everything it needs to, and any additional information will have to be taken with a grain of salt. As a side note, trolling is not effective if you're ALWAYS trolling or even just too often. So we try to not overdo it. Now that's just mean, but I know I've done it before to protect actual information or just out of spite in response inane questions. In the end it mostly comes down to point #1 anyway. This does happen a lot, hopefully not so much in content that is actually already out (and as such has the "highest canonicity" if you care about such a thing). We don't intend to change Act 1 in any meaningful way, but we will if we think we have to. And in the unreleased part, well... I'll just say I'd be more than happy if we changed our mind less often. Thankfully it does not seem to happen as frequently as it used to at this point. If I get asked a question, or even if it just strikes me by accident, I may make a statement about some thing that is not relevant to the story at all. This will, for all intents and purposes, be "canon" until someone else on the dev team cares enough to contradict it; but does that matter? In fact, if it mattered, would it not be in the game narrative in the first place? • It's not like Katawa Shoujo is an exercise in world building like other franchises. We don't really care whether there is a bigger universe outside the story we tell; if we did, we would surely have made said world more interesting. This is not Star Trek, or Lord of the Rings, or even Fate/stay night, it's just a little story. We do care about canon as far as consistency within the work is concerned, but not a lot beyond that. • It's not like the story this supposed world is built around even exists in any meaningful capacity yet, so everything we say is subject to change. 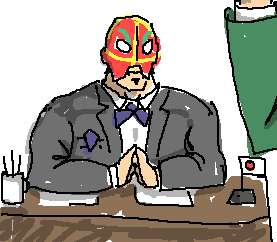 For example, I have said before that Richter Bromont's depiction of the Yamaku principal as a Luchador wrestler is actually true. I know that there is nothing to contradict it in the game at this point (because he does not appear, and nor is mentioned in enough detail to make the call), so I'm not even outright lying. I just think it's funny, but does this make it "canon", an in-universe "truth"? I guess so, but I'm also aware that if we actually did decide to show him, he'd be something less... random. In fact, the principal did appear in an early draft, and in there she was a woman. Maybe THAT is more canonical than my offhand remark? But it's not in the game anymore either. The fact of the matter is that there is no objective reality beyond what is shown in fiction, and even for that you have to trust the writer. Seems obvious, but I've read Umineko no Naku Koro ni recently, and I've seen that fans of Umineko have a real problem realizing that even a universe designed at least with some degree of worldbuilding in mind is still made up and does not necessarily have to make sense in the way reality has to**. Whether that still constitutes good writing is up to the reader, of course. And even if something is not stated to be one way or the other, "undefined" can be perfectly canon. See the ending of Inception, and how a part of the audience refused to accept that as well. Then there is the matter of fanon; Touhou is a franchise that is mostly fanon, and if enough people believe something is canon in that one, that definitely makes it "true" eventually. Fandom can take matters into their own hands, and if that is more enjoyable than the core narrative, who would argue against it? So, I will not condemn people pulling together various remarks and trying to build a bigger universe if they consider it fun; it's just we ourselves don't care enough to keep track of it because keeping track of actual core material is already stretching it. I am of the opinion that everything that matters is/will be in the game, and would take a small cheap laugh of the moment over building a greater universe than we need - It's not like we're forced to have sequel or spinoff hooks like a lot of commercial franchises. If we're lucky, all of these side ideas might in fact combine to one emergent fictional universe. But don't bet on it. * I find it slightly absurd to call writers "gods", yes I know it's a tvtropesism, but that doesn't make it any better, can't get into any decent discussion without tvtropes and their CamelCase puns infesting every single one these days, don't care if it was around before but tvtropes codified it into a nuisance, get off my lawn, I mad, etc. ** In fact, now that I think about it, Umineko made "trolling, lying, changes of mind and making stuff up on the spot" a core part of the narrative, and people seemed to actually like it specifically for that - I kind of did, to be honest. Not much else, but that's beyond the scope of a simple blog post.